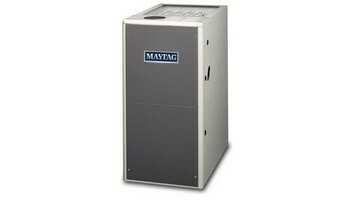 Maytag Two-Stage Fixed-Speed Gas Furnace Peak Heating Comfort: This unit operates in two stages for complete home comfort, including: a better mix of air and reduced instances of uneven temperatures .Efficient Heat Designation: Specific sizes and matches of this gas furnace qualify for the ENERGY STAR high-efficiency designation. Ask your contractor for more information. SEER Efficiency: When shopping for a gas furnace, don’t just take the unit’s heating efficiency into account. Gas furnace models can boost the cooling efficiency of your 13- or 14-SEER air conditioner or heat pump by up to a SEER point. That means year-round, efficient performance. Insulated Compartment for Sound Reduction : For exceptional noise reduction, this furnace comes equipped with an insulated blower compartment.Assured Comfortable Start-Up Temperature: Pleasant temperatures greet you as soon as the furnace kicks on. This unit includes a 30-second blower delay that assures a warm duct temperature at start-up.Increase Ignitor Life: Smart Start technology can extend the life of your ignitor by learning the start-up characteristics of your unit and adjusting its firing percentage accordingly.Before being installed in your home, or even shipped to your contractor, this unit undergoes 234 quality checks.Energy-saving performance can be a big perk of choosing a new gas furnace. The Maytag M12000 PGC2TC and PGC2TL fixed-speed gas furnaces offer extra-efficient 95.1% AFUE heating capabilities. When you combine these furnace models with Maytag® coils and cooling systems, you can expect year-round home comfort and premium performance. Additional comfort is also provided by the two-stage gas valves.If the heat exchanger (the major component of your furnace) or the compressor (the most important part of your air conditioner or heat pump) fails within the first 12 years (when registered), or five years (not registered), we'll replace the product with like product under the Maytag Dependability Promise program.When you register you new Maytag furnace or gas/electric packaged system, we will also extend the heat exchanger warranty to a limited lifetime heat exchanger warranty .While the Maytag warranty covers parts, the cost of labor charged by your dealer for service and repair is not. However, extended labor protection plans are available to cover labor costs associated with repairs. Your dealer may offer various coverage plans; we recommend you look for the Contractors' Preferred Protection Plan brand approved for Maytag.